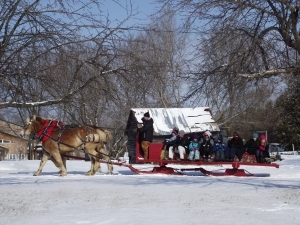 For a private reservation of one of our horse-drawn sleighs or wagons continue reading below. Please note that we are only able to offer private reservations for Sleigh & Wagon Rides OUTSIDE of our public operating hours. We book private horse drawn rides starting in December through early March, outside of public operating hours. Our horse-drawn sleighs and wagon are approximately one hour long and accommodate up to 20 adult guests. We have a driver as well as a coach man on the ride and they are always more than willing to give you a brief history of the farm, farm events and the surrounding community. This gives your guests a real sense of the farm and area history. The ride travels around the farm through the forests that we tap for Maple Syrup. Once you get back after your hour ride you can visit the farm animals in the barn, go to the Stone House gift shop and enjoy a cup of Hot Chocolate and a fresh-baked cookie. The whole experience will last about 2 hours. For example: Arrival 1:45pm, Sleigh Ride 2pm, Cookie & Hot Chocolate 3pm, & Departure before 4pm. Sleigh Rides are not available on Christmas Day. Cutter Sleigh Package is NOT available during Sugarbush Season. Imagine whisking across the snowy fields snuggled under a faux-fur blanket with your love. Our traditional antique, one horse open sleigh, is the perfect romantic getaway. 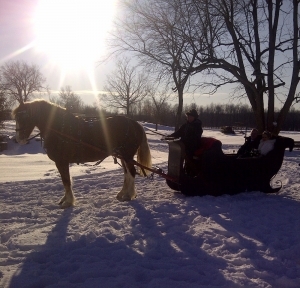 Rental is for a one hour sleigh ride and includes the faux-fur blanket & Hot Chocolate for 2.